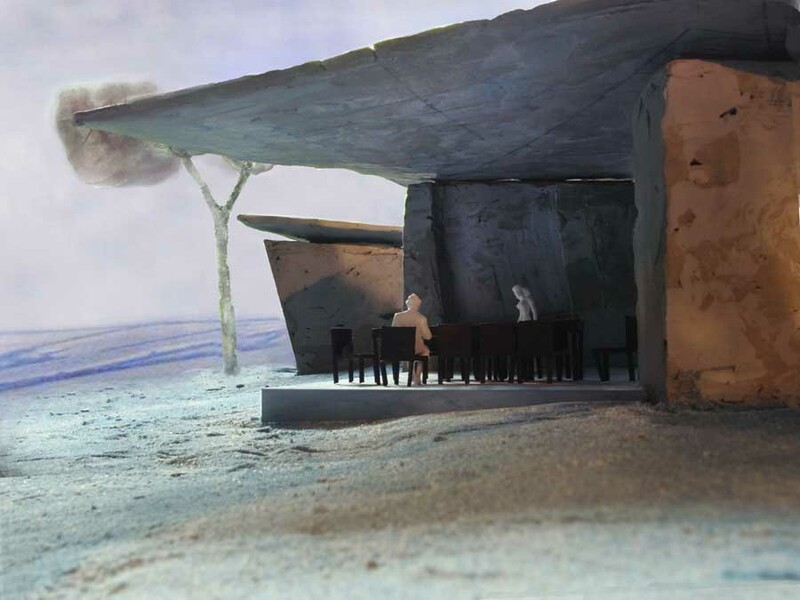 The Secular Retreat is designed by Peter Zumthor for Living Architecture and is scheduled for completion in December 2018. 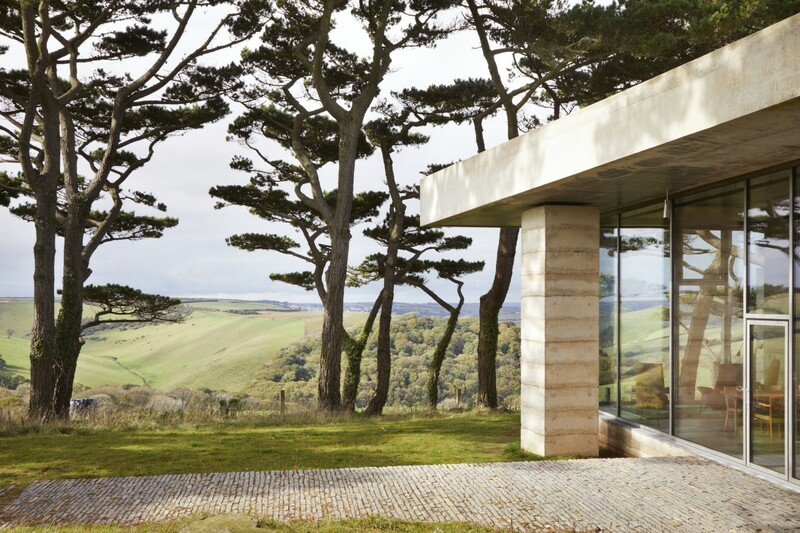 Living Architecture is delighted to announce the near completion of Secular Retreat, Chivelstone, Devon, designed by Pritzker prize-winning architect Peter Zumthor. It will be the architect’s first permanent building in the UK, and marks the seventh commission in a visionary series of houses designed by leading artists and architects in distinctive, unique sites across England. 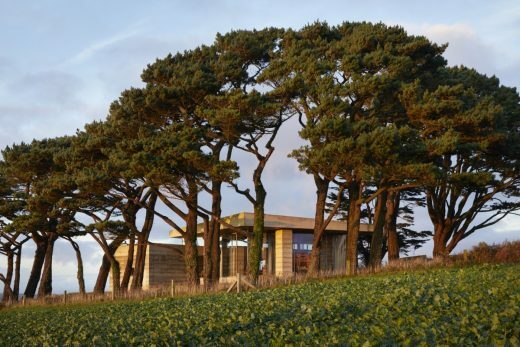 The house is situated on a South Devon hilltop, one mile from the coast above the small Hamlet of Chivelstone. 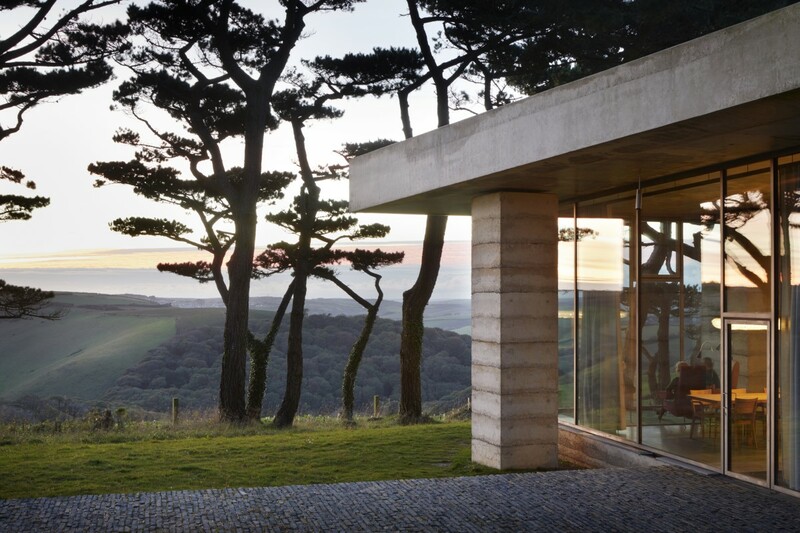 The dramatic layered-concrete and glass design sits horizontally on the site, framing stunning views across the landscape in all directions. Handrammed concrete forms both the interior and exterior spaces, to give the building a mass and scale characteristic of Zumthor’s work. Peter Zumthor has been described as one of the greatest architects at work in the world today. He was awarded the Pritzker Prize in 2009, and the RIBA Gold Medal in 2013. Renowned buildings he designed include the Thermal Baths at Vals in Switzerland, the Bruder Klaus Chapel outside Cologne in Germany and the Kolumba Museum in Cologne. He is currently working on designs for museums in Basel and Los Angeles, alongside many other commissions. In 2011 he designed the Serpentine Gallery Pavilion, a black painted structure with internal corridors leading to a courtyard that housed a garden designed by Piet Oudolf. 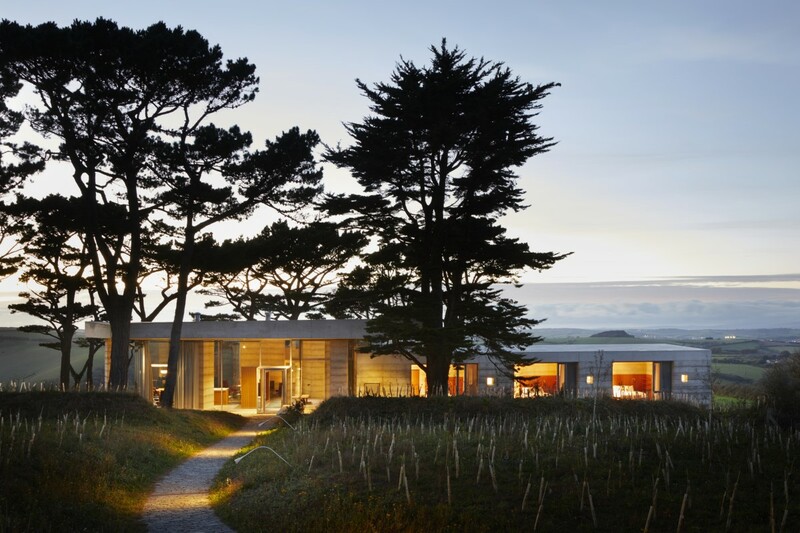 With Secular Retreat, Peter Zumthor continues his tradition of creating thoughtful and timeless architecture. The house sits in the place of a ruined timber house constructed in the 1940’s. 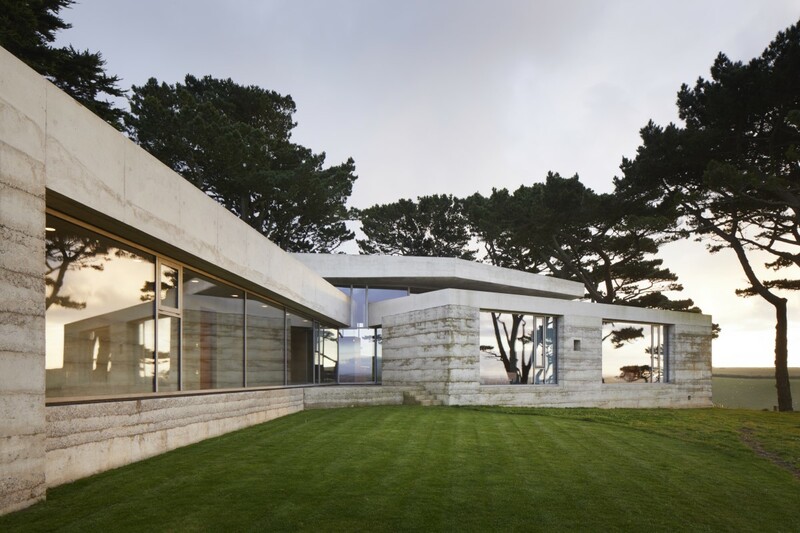 Links to the original site remain, with a small hexagonal shaped walled area made out of layers of concrete block, and the now 20-metre-tall Monterey Pine trees planted to shield the original house. 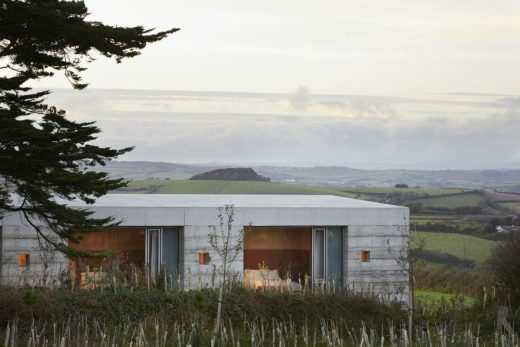 In character with Zumthor’s approach, the landscape and garden are central to the concept of the house. The garden is designed with the South Devon based Rathbone Partnership and comprises the planting of some 5,000 local species of trees and shrubs. Terraces and pathways are made of rough-hewn Somerset Blue Lias stone, set on edge. Zumthor is renowned for his craftsmanship and expertise in the use of materials, which give his buildings an eternal quality. Creating and maintaining the consistency of concrete to produce the hand-rammed walls, and the engineering of both structure and integration of services throughout the main concrete frame, was delivered by a dedicated group of UK architects, consultants and contractors, who have come together with Zumthor’s team to produce this exemplary building. The house will accommodate up to ten people in five bedrooms and is formed of two separate bedroom wings which lead from the large central open-plan living space. 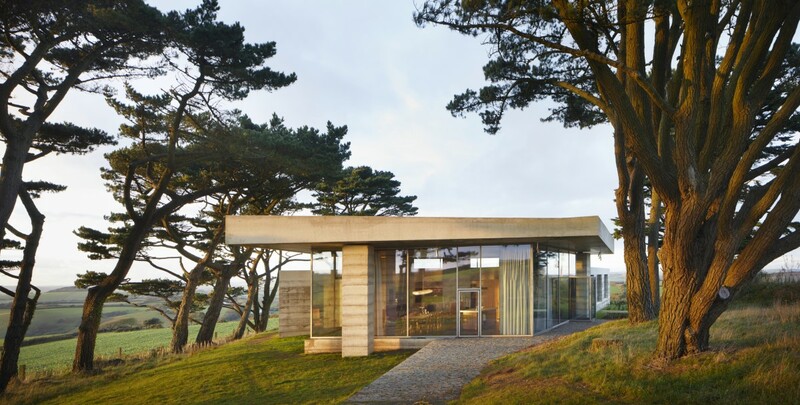 The design and construction required a series of exacting processes to be undertaken, from the careful placing amongst the existing trees, the orientation on the site to make the best of the views and natural light, to the creation of new gardens and outside areas. Internally, the continuous ribbons of layered-concrete are set against stone floors, each slab cut to a different size and shape reflecting the raw material sourced directly from a Somerset quarry. 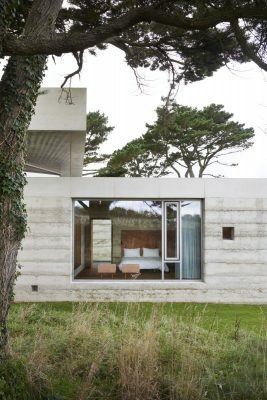 Bedrooms are simple in form – a large carved niche within the concrete fabric, timber Pearwood floors leading to full height and width windows, allowing views onto the gardens and the surrounding valleys. 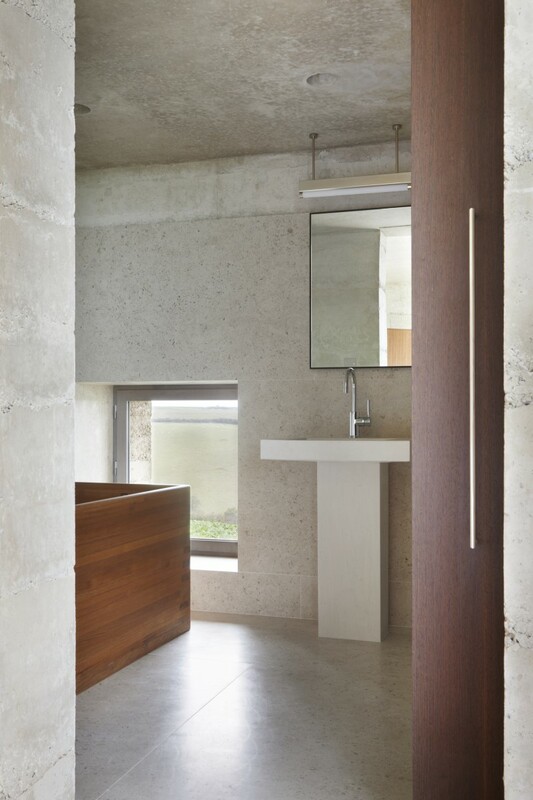 Ensuite bathrooms continue this theme, with a combination of stone and rammed concrete. Throughout, the carefully crafted joinery of doors, inset shelves, wardrobes and kitchen furniture, all made from apple and cherry woods, bring a warmth and depth of contrast to the handmade concrete walls. With sofas, chairs, tables and lights all designed by Zumthor, Secular Retreat is the realisation of his long-held vision for this Devon hillside. Over the last decade, Living Architecture has commissioned carefully designed and thought-provoking domestic houses, available to all for holidays in the best of modern architecture. With a mission to promote, educate and influence discussion, the houses provide an immersive architectural experience, created by some of the most relevant architects and artists working today. Secular Retreat completes a visionary series that has realised seven landmark projects across England including the award-winning Dune House in Thorpeness, Suffolk (Jarmund/Vigsnæs Architects); Balancing Barn in Thorington, Suffolk (MVRDV); Shingle House, Dungeness, Kent (NORD); Life House, Wales (John Pawson); and A House for Essex (FAT architecture and Grayson Perry). A Room for London (David Kohn Architects with artist Fiona Banner) was commissioned by Living Architecture and Artangel and installed on the rooftop of Queen Elizabeth Hall for the Olympic year of 2012, where it remained until February 2018. A space dedicated to calm, reflection and perspective, The Secular Retreat is a veritable haven from the pressures of modern life. In South Devon, between the resorts of Salcombe and Hallsands, lies a landscape of rolling hills, wooded river valleys, patchwork fields and small stone villages. It is here that Zumthor is designing his first project in the UK – The Secular Retreat, a hill-top retreat, where people will be able to go for periods of sustained work and reflection. The design makes use of an original rammed concrete that gives the building a mass and scale characteristic of a timeless example of ecclesiastical architecture. Swiss architect Peter Zumthor is frequently described as the greatest architect at work in the world today and was awarded the internationally prestigious Pritzker Prize in 2009. He is famous for his baths at Vals in Switzerland, his Bruder Chapel outside Cologne in Germany and his Kolumba Museum in Cologne itself. He is a master of craftsmanship, and an expert in the use of natural materials, which gives his buildings an eternal quality. Living Architecture has commissioned houses by NORD, MVRDV and Hopkins Architects.